Grrrrr! We’re so bloody angry! Millions of you out there viewing this blog (I wish!) will have read several outspoken articles that I have written on the UK government’s “frozen pensions” Policy which has been in existence for over 70 years now. 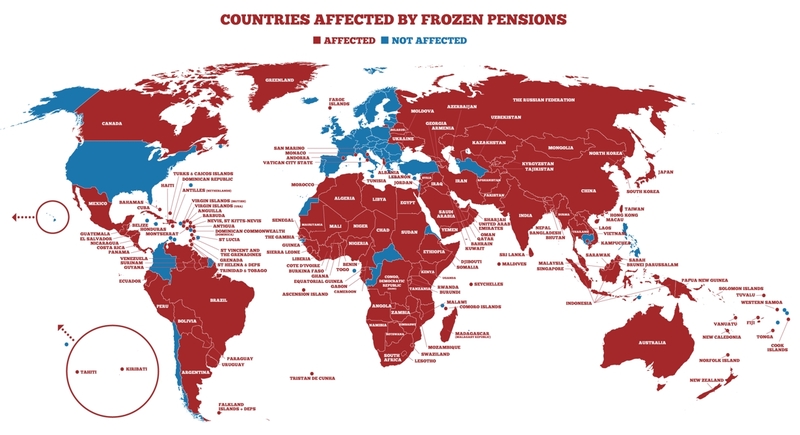 If you live in one of 120 countries (of which Canada is one) your UK State Pension is “frozen” at the level at which it is first received, and you will not receive the annual increases. This affects the over 133,000 recipients of the UK State Pension who live in Canada. The UK is the only country in the OECD (out of 35) that operates this immoral and discriminatory policy. The Canadian Alliance of British Pensioners (CABP) has been lobbying the UK government for over 25 years in an attempt to annul this outdated policy. I would like to tell you about Vic Williams, one of the strongest CABP supporters, who died a couple of months ago at the tender age of 96. I know that this blog normally tells you about successful Brits living in Ontario. As Vic lived in Mississauga, I think that he would have counted. Vic passed away at the grand old age of 96, and he was of the old school. Born in the East End of London he was a true Cockney, and, like all Cockneys he was a born storyteller, entertaining all who new him with fascinating (and often hilarious) stories of his rich life, which began in London England, where in his youth he was a talented soccer player. Back in post-war London Vic met Helen, and they were married in 1954. They emigrated to Canada in 1956 and settled in Mississauga in 1958, where their family of three soon grew to five. Vic worked for Alcan for over 25 years, rising to a management position, and in the process teaching his children the values of diligence and hard work. Despite the Cockney accent that never quite left him, he was a proud Canadian, camping with his family and exploring Canada with Helen. In retirement, Vic and Helen became founding members of the Probus Club of Mississauga Centre which provided them with many opportunities to enjoy activities with new friends. Vic was known as an avid horse-racing enthusiast and a prudent handicapper, who usually came out as a winner upon placing a bet. A generous man, Vic often gave his winnings to family and charities. As a proud WW II veteran, he was a member of the Royal Canadian Legion, participating in Remembrance Day ceremonies each year. Until recently, a fiercely independent Vic continued to live in the Mississauga house that has been the family home for almost 50 years. Vic was always proud of the fact that, in his youth, he knew Michael Caine. Even when he was in his early nineties, he was still able to attend the CABP AGM’s where I had the honour of meeting him. In 2013, Vic, in conjunction with the CABP made a Remembrance Day video for the then Prime Minister, David Cameron beseeching him to revoke the unfair, immoral and discriminatory “frozen pensions” policy. I am not sure if Mr. Cameron ever saw the video. Because of the UK government’s “frozen pensions” policy, UK pensioners living in Canada who retired at the same time as Vic, and who have earned a “full” UK State Pension will have received more than £67,000 less than their peers in the UK, even though they will have made the same level of National Insurance contributions. In Canadian Dollar terms (using historic exchange rates), this amounts to close on CAD 129,500, which is not chump change and is a life-changing amount for many older pensioners who may have become dependent on the Canadian government for handouts and subsidies. According to Statistics Canada, as at 2016, there were 828,000 pensioners living in Canada aged 65 and over on “low income,” and, according to the Government of Canada, as at 2016, 10.3% of men and 10.8% of women aged 65 and over were living below the poverty line — in terms of UK pensioners, this means over 14,000 of them are living below the poverty line. According to the UK’s Department for Work & Pensions (DWP), there are 38% of UK pensioners living in “frozen” countries (like Canada) who are receiving a UK State Pension of less than £20 per week (CAD 32 per week), at current exchange rates. Who can live on this? If you are a regular follower of this column, you will know that I have a good friend, James (real person but name changed) who is a doting pensioner in his eighties (https://britsintoronto.com/2018/03/19/brexit-update-nothing-is-agreed-until-everything-is-agreed/). I usually find him chortling in his G&T, but times are so hard that he has run out of gin. He recently went down to his wine cellar to get a bottle of claret, but he has also run out of that. Times are hard. Things haven’t been helped by what is happening (or not happening) with Brexit. All UK State Pensions are paid in GBP. Most pensioners are living pension cheque to pension cheque. This mean that they are hostages to fortune when it comes to exchange rates, and have to take the rate on the day that they receive their pension cheque. According to the latest DWP figures, the average UK State Pension received by pensioners living in Canada is just over £41 per week. At the beginning of June 2016 (just before the Brexit referendum), this would have been worth nearly CAD 80 per week. By the middle of July (just after the Brexit referendum) this would only be worth CAD 70 per week. 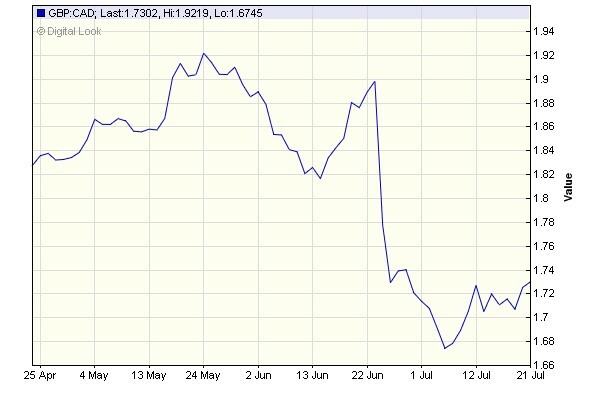 The longer that the UK government prevaricates over the Brexit deal (or no deal) the more jittery the currency exchange markets become, and this means the UK pensioners living abroad will be worse off. In fact, my friend James receives a smaller UK State Pension today in CAD terms than when he first retired. When he first retired in 1998, he was receiving £64.70 per week. The exchange rate in those days was 2.37 CAD to the pound, so he was receiving CAD 153 per week. Today, he is still receiving £64.70 per week, but this is only worth CAD 109 per week — so he is receiving a staggering 29% less now in real terms than when he first retired. Meanwhile, according to the Bank of Canada, inflation has risen by over 46% since 1998, when James retired. Whilst the UK government cannot be held completely responsible for the changes in exchange rates, it is impossible for UK pensioners living in “frozen” countries to budget when their income base is in decline, and inflation is rising at an average rate of nearly 2% a year (at least, in Canada). However, the annulment of the “frozen pensions” policy is entirely in the hands of the UK government, and the fund from which the State Pension is paid (the National Insurance Fund) currently has a £6 billion surplus. Meanwhile, to uprate the UK State Pension for all pensioners living in Canada would cost a meagre (in comparison) £159 million per year. Hopefully, Brexit may force their hands, but that is a story for another day. In the meantime, it is enough to drive James and his pensioner friends to drink … except they can no longer afford it. The gin is all drunk, and so is the wine. All that is left for them is to try their hand at homebrewing. Prior to the General Election called by Theresa May in June 2017, the then Pensions Minister, Richard Harrington had asked for a meeting with the International Consortium of British Pensioners (ICBP) — 50% owned by CABP. The CABP flew a Board Member to London for the meeting. Mrs May called a General Election before that meeting could take place, and the meeting was called off at the last minute. After the General Election, the Pensions Minister role was downgraded to the Parliamentary-Under-Secretary role, and Guy Opperman was appointed. Since then, there has been no contact. There was no apology, no offer to reimburse the ICBP for the costs that they had incurred – nada. If there are any questions you have relating to the UK State Pension, you can call the CABP toll-free on 1-888-591-3964 or contact info AT britishpensions DOT COM. This entry was posted in Uncategorized and tagged brexit, british state pension, brits in toronto, cabp, canadian alliance of british pensioners, canadian association of british pensioners, international consortium of british pensioners, nigel nelson, uk pension, uk state pension on August 13, 2018 by britsintoronto. We recently ran an article by the Canadian Alliance of British Pensioners entitled “Quirks of the UK State Pension affecting British pensioners living abroad” that really hit a nerve with our readers. It got a ton of traffic. The main crux of the issue is the fact that UK pensioners living abroad in certain countries — including Canada — have their state pension frozen … but those living elsewhere see the amount they receive uprated annually. We feel that’s a tad unfair. Luckily, Ian Blackford, upstanding bloke and MP for Ross, Skye and Lochaber, is leading the charge to amend things and said, “The Government should reflect on the ‘injustice’ of the current system,” as he highlighted the strength of support for change among a large group of cross-party MPs. The full story is covered by The National and we at Brits in Toronto think it’s a good read and an issue to keep an eye on. This entry was posted in Uncategorized and tagged british state pension, brits in toronto, canadian alliance of british pensioners, uk pension, uk state pension on May 12, 2016 by britsintoronto. This is a free, non-paid-for guest article by Nigel Nelson, a member of the Toronto-based non-profit Canadian Alliance of British Pensioners (CABP). All views are the CABP’s and Brits in Toronto does not endorse them and is not held liable in any way. As always, do your due diligence. Have you ever worked in the UK? Did you make National Insurance contributions (NICs) when you worked? Depending on the number of years of NICs you have to your credit you might qualify for a British state pension. However, if you qualify for a UK State Pension, as long as you live in Canada, you will not receive the annual inflationary increase as given to pensioners in the UK, EU and an obscure list of countries. This is known as the British “frozen pensions” policy. The Canadian Association of British Pensioners was established in 1991 to help British pensioners living in Canada navigate the UK State Pension system by providing information with respect to eligibility for a British State Pension; keeping current with the successive changes which have been made to the UK State Pension system and lobbying the UK government for parity with all British pensioners living overseas. We can answer your questions about the UK pension system. CABP is a registered non-profit organisation and all of the directors are volunteers, as are most of the people who work out of the office in Toronto. Anyone who has worked in the UK and has paid National Insurance Contributions may well qualify for a UK State Pension. Those people in Canada look to organizations like the CABP, which has the experience and understanding of the UK pension system, for advice. There are over 5,000 members in Canada who currently get this support. According to the 2011 Canadian National Household Survey, there were 125,000 British immigrants over the age of 65 living in Ontario and another 65,000 in the 55-64 age category. In Toronto alone, there are 43,000 and 24,000 respectively. Many of these immigrants will qualify for a British State Pension, but may not know that; and they’re probably unaware that, once they start to receive a UK State Pension, they will never receive any of the annual increases enjoyed by their peers in the UK … even though they will probably have paid the same level of National Insurance Contributions. Successive UK governments for over 70 years have followed this “frozen pensions” policy. The policy is based on outdated logic and the UK government has now conceded that the only impediment to eliminating the “frozen pension” policy is cost, accompanied by the “political will” to do so. There are over half a million “frozen” UK pensioners living abroad — 90% of these “frozen” pensioners live in Commonwealth countries such as Australia (45%) and Canada (28%). CABP provides support to UK pensioners in Canada and they work tirelessly in trying to abolish this unfair and immoral policy. For example if you live on the American side of Niagara Falls you would receive the annual increase; if you live on the Canadian side of the Falls you wouldn’t receive the increase. If you had retired in 1980 with a full UK State Pension it was just £27.15 per week — slightly over $50 in today’s money. Could you live on that? There will be cases where members, who do not have the full number of years of National Insurance contributions, are living on less. A UK pensioner retiring on a full State Pension in 1980 will have been underpaid by £80,000 up to the end of April 2016. Today’s UK State Pension, at £119 per week, is 440% more than it was in 1980! CABP believes that this is unfair, discriminatory, and immoral, and they have been campaigning since 1991 to get this policy changed. In comparison, the CPP payment is payable to Canadians globally and is adjusted annually wherever the Canadian pensioner chooses to live. Sadly, some of these pensioners even have to go back “home” to the UK since they can no longer live on their “frozen pension.” This is causing them considerable angst — leaving behind their loved ones, having to make travel arrangements, and finding accommodation when they get back. For example, last year alone, there were 2,000 UK pensioners who returned back to the UK, and, for many of them, it will be because they could no longer afford to live in their country of choice, based on the state pension they were receiving. Any returning pensioner to the UK has their pension uplifted to the current rate — the same as all other pensioners living in the UK. They also qualify for other social welfare benefits. Currently, the UK Treasury saves over £4,300 per year for each pensioner emigrating, so, for returning pensioners, it adds to UK Treasury costs. Given these numbers, you would think that the UK Government would be encouraging pensioners to leave rather than putting barriers in their way. The good news is that there is a glimmer of light at the end of the tunnel. A proposal, with respect to amending the “frozen pension” policy has been submitted to the Cabinet Office in the UK Parliament in London. The proposal is currently under consideration, but is by no means a “done deal” … and so we must keep up the campaign. If you would like to find out more about your British Pension rights and how you will be affected by a “frozen pension,” or, you would like more general information, you can check out the CABP. CABP is based in Toronto and can provide a wealth of current and accurate information with respect to British pensions. Contact information is on the website. This entry was posted in Uncategorized and tagged british state pension, brits in toronto, cabp, canadian alliance of british pensioners, canadian association of british pensioners, uk state pension on March 9, 2016 by britsintoronto.